Set up a VPN server in less than 1 minute. Free client software. iPig creates a secure "tunnel" that protects your inbound and outbound communications (Email, Web, IM, VOIP, calls, FTP, etc.) at any Wi-Fi hotspot or wired network. iPig works with any kind of Internet connection (Wifi, WLAN, wired ethernet). iPIG shields your data from even the most sophisticated methods of online spying and snooping like the "Evil twin attacks". ...... 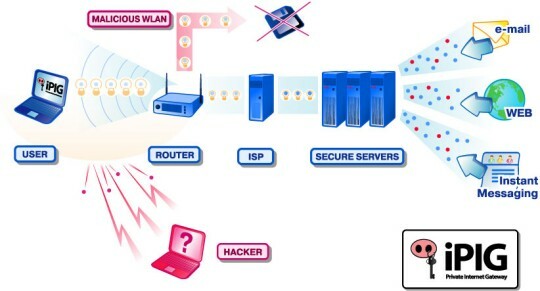 In addition, your sensitive information is not only protected between your computer and the wireless access point you're using, but all the way to iOpus' secure connection servers deep in the Internet. This ensures that your data can't be easily hijacked through the air and at the point it transitions to a "wired" Ethernet connection. Unlike other technologies, iPIG Secure Access VPN Server works with any kind of Internet connection (Wifi, WLAN, wired ethernet) and requires NO configuration of any kind. You just start your favorite web browser, email client or chat software and switch the iPig encryption on: iPIG Secure Access VPN Server grabs all Internet traffic before it leaves your PC and encrypts it securely! iPig also works with all major firewall software like Zonealarm or Norton Internet Security. iPIG Secure Access VPN Server software runs on Windows 2000, XP and 2003 (Sorry, Windows 98, ME are not supported). Qweas is providing links to iPIG Secure Access VPN Server 1.00 as a courtesy, and makes no representations regarding iPIG Secure Access VPN Server or any other applications or any information related thereto. Any questions, complaints or claims regarding this application iPIG Secure Access VPN Server 1.00 must be directed to the appropriate software vendor. You may click the publisher link of iPIG Secure Access VPN Server on the top of this page to get more details about the vendor.